Fenway Park turns 100 this year and you can bet the Red Sox will make a big deal about it. I'm starting the fanfare early by looking back at Boston baseball (and its cards) during Boston's first season in what's now the majors' oldest active stadium. Boston built two new stadiums in that era (Fenway Park, 1912 and Braves Field, 1915) as crosstown competition for money and prestige spread across a decade of World Series championships, four by the Red Sox (1912, 1915, 1916, 1918) and one by the Braves (1914). Cy Young closed out his career with the 1911 Boston Rustlers, going 4-5 across 11 starts. Hassan's set anticipated his return in 1912, but Young decided to retire to the family farm. Team owners changed their NL franchise from Rustlers to Braves between seasons, a name it retains despite later moves to Milwaukee and Atlanta. A handful of Boston players show up in another rare 1912 issue, Base Ball Bats Candy. I'd never heard of this crude-looking set prior to looking up Fenway's centennial, but Old Cardboard was there for me again with another set profile and checklist. J=K Candy took a page from the Base Ball Bats Candy book by printing blank-backed player photos on their boxes, which collectors could clip away and save. The known checklist contains five Boston players. Finally, there's the super-obscure Plow's Candy, an attractive 3" x 4" set that PSA claims "takes rarity to the limit." John Kling and Tris Speaker once again represent Boston in this 68-card set, checklist at Old Cardboard. So few examples exist for most players that it's possible collectors will discover more, but the count's held steady for about 10 years. 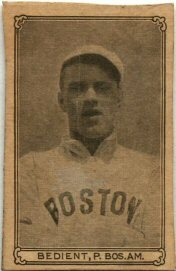 That wraps up the Fenway centennial sets with Boston players I could track down. Opening day's only a month away--let's play some ball! I now know that I can find candy and garters here. Great. Hope that my ISP doesn't block me. Oh, to purchase a box of licorice with baseball cards on the box. There are times when progress just isn't. Funny they call the licorice "a penny package that is making good." Maybe "local boy makes good" was already a sports saying back in those days?